I was getting a little nervous this week as I didn’t find anything to use as the Photo of the Week this time. 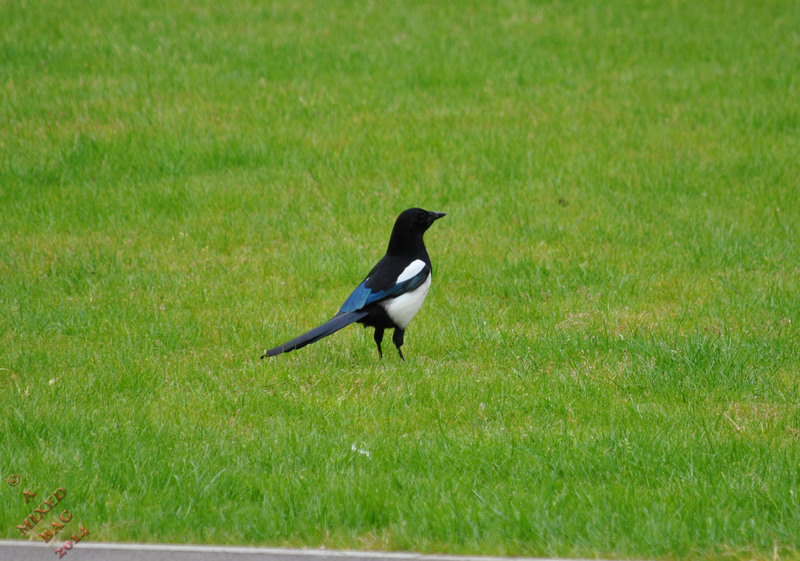 It wasn’t until yesterday that I spotted this Magpie in the college ground. This entry was posted in Photography and tagged Birds, Creatures, Life, May, Nature, Nikon, Nikon D3000, Photo of the Week, Photos, Postaday. Bookmark the permalink. I love it when I hear people call them “albums” instead of CD’s but that is what even younger artists say sometimes. I think it is a generational thing. What is interesting though is there are some newer artist who are recording on vinyl again….. maybe a returning trend. You caught his (her) good side. Very stately and aerodynamic. these are good photos. I have an old wise tale about the crows and death coming. It has been proven three times in my life now. Once again, great shots!! Great shot!!! I have heard them but never see one so closely! This is a great snapshot, Alastair. Wonderful shot of a very beautiful bird Al, thanks for sharing and have a blessed weekend! I love magpies. There are a lot of them in Korea and they’re seen as a very good bird. Do you know the rhyme that goes with them? I think they are the most gorgeous of the crow (corvidae) family. I think I’ve heard that at some point; it sounds vaguely familiar.